Turning your Campbell Scientific data logger into a DNP3 outstation is a great way to allow systems that use the DNP3 protocol to have access to your live measurement data, as well as historical data. When you use your data logger as a DNP3 outstation, the data logger is configured to implement the DNP3 communications protocol and listen for DNP3 polls from a DNP3 master, such as a SCADA (supervisory control and data acquisition) system. To better understand how this works, we’ll go through an example exercise to show the basic concepts of how to implement the DNP3 protocol on a data logger. Recommended for You: If you are new to DNP3, you may find it helpful to review our “Getting to Know DNP3” blog article and reference “A DNP3 Protocol Primer” provided by the DNP Users Group. 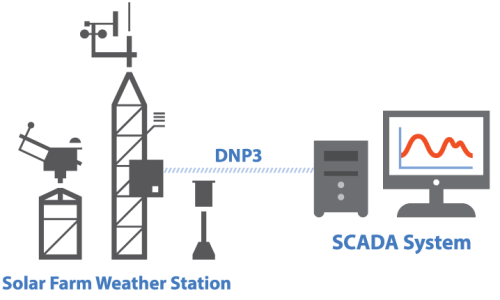 For our example, let’s consider a meteorological station, or “MET station,” installed on a 5 MW operational solar farm that needs to report its data to the local SCADA system using a CR1000 datalogger. Program our data logger to listen to DNP3 polls on the appropriate communications port. Assign a DNP3 group and variation to the variables. With each scan, update our DNP3 data points and scale the values if needed. Let’s take a closer look at the DNP(), DNPVariable(), and DNPUpdate() instructions we added to the program code. By the way, we add the DNP() and DNPVariable() instructions between the BeginProg and Scan statements because they only need to execute once at compile time rather than being executed during each scan. The COMPort parameter defines the communications port on the data logger that is set to listen for DNP3 polls. In our example we have set the COMPort parameter to 20000—the industry standard TCP/IP port for DNP3. The BaudRate parameter specifies the baud rate of the communications port. This is set to zero and is not applicable when communications are over TCP/IP. 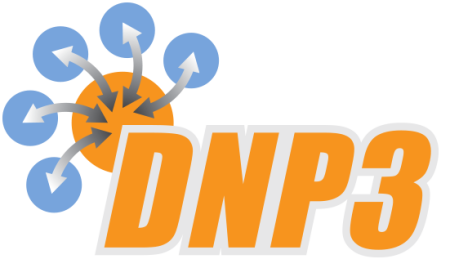 Two DNPVariable() instructions follow the DNP() instruction in our example. These instructions define the structure of the DNP3 data in the data logger. The first of the two DNPVariable() instructions defines the “static” or real-time data as it is measured in the data logger. The Source parameter specifies the array in which the DNP3 data is stored. In our example we are using the variable named G30V1. The Swath parameter specifies the number of elements in the array that are included in the DNP3 data structure. In our program example we have 10 data points. The DNPObject, DNPVariation, and DNPClass parameters are used to define the type of DNP3 data that is stored in the data logger and made available to a DNP3 master. The DNPObject parameter (like a field in a table) defines the group number of the DNP3 data. The DNPVariation parameter (like a data type for a field) defines the variation of the data type within the group number. The DNPClass parameter (like selecting a data table to put the field into) defines the class of the data. Static data is always 0, and event data is classified as 1, 2, or 3. We are using Group 30 Variation 1 in our example, which is a static 32-bit analog input with flag. The DNPEvent parameter is the parameter that defines when a DNP3 event is created. If the event parameter is set to a constant 0, as it is in our example, an event is created every time the DNPUpdate() instruction is executed, and there is a change to the source variable. The DNPNumEvents parameter defines the number of events that are saved in the data logger memory. For example, if we enter 100 for this parameter, 100 events are stored for each data point in the source array. The second DNPVariable() instruction defines the “event” data that contains a history. Here we are loading our measurements into our source array. This array is defined as the Source parameter in the DNPVariable() instruction. We are using the DNP3 data type of Group 30, Variation 1. This data type is an analog input formatted as a 32-bit integer. To preserve some of our measurement resolution, the values are scaled by a factor of 100 as they are transferred to our DNP3 source array. The last bit of DNP3 code in our instruction is the DNPUpdate() instruction. This instruction is used in a similar fashion as the CRBasic CallTable() instruction, which is used to update our data tables. The DNPUpdate() instruction updates our DNP3 data structure in the memory of our data logger. Upon execution, it stores any newly created events and the real-time static data. This instruction also defines the DNP3 address of the data logger, as well as the DNP3 address of the DNP3 master that the data logger listens to. In our example, our data logger outstation address is 1, and the DNP3 master address (normally the SCADA system) is 10, as we declared in our Constants section of the program. This article shows an example of how to use a CRBasic program to turn your Campbell Scientific data logger into a DNP3 outstation for accessing both your live measurement data and historical data. For more details about DNP3 programming, read the “DNP3 with Campbell Scientific Dataloggers” application note. We plan to publish future blog articles that more thoroughly discuss some of the different aspects of DNP3 and its implementation in Campbell Scientific data loggers. Until then, if you have any DNP3 comments or questions, feel free to post them below. Paul Smart is the Vice President of Sales and Marketing at Campbell Scientific, Inc. His first experience with Campbell equipment came soon after graduating from college while working on a series of plant-growing experiments conducted on the International Space Station. Paul enjoys leveraging unique Campbell Scientific technology to solve challenging measurement problems. He has a bachelor’s degree in Electrical Engineering and an MBA. Paul also enjoys the outdoors, fly fishing, and spending time with his family.